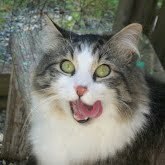 This is an invitation to follow my new cat blog on WordPress. I used to write a cat blog on Blogger, but I think WordPress is better technically and all around, so I shall continue what I was doing on Blogger here. I may reuse some old Blogger material.